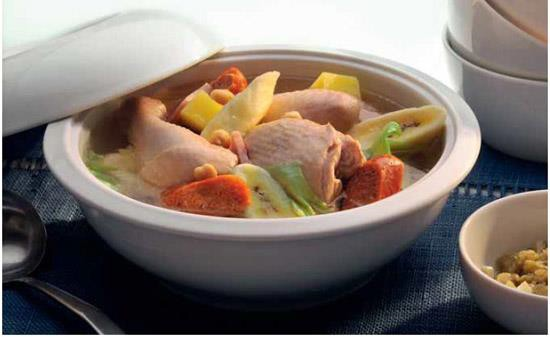 Filipino Pochero is similar to Spanish Cocido, a stew of chicken, sausage and vegetables. The Filipino version, however, uses a delicious garlic and eggplant sauce that sets it apart. This is a regular Sunday meal and, in some households, it is made right after Christmas when there are plenty of leftovers. Variations are found all across the country. Adding beef or pork creates a wonderfully meaty stew. 1. To make the Eggplant Sauce, boil the eggplant over high heat for 5 minutes or until soft. Cut off the stem end, peel the skin and mash the flesh. Combine the mashed eggplant, garlic, vinegar, salt, and pepper in a saucepan and simmer over medium-low heat for 3 minutes. Set aside. 2. Place the chicken, chorizo, ham, salt and 5 cups (1.25 liters) water in a saucepan and bring to a boil. Reduce heat to medium and cook for 30 minutes, or until the meat is tender. Remove the meat with a slotted spoon. Set the saucepan and broth aside. 3. Heat a skillet over medium heat, add the oil. Add the garlic and sauté until lightly browned. Set aside. 4. Add the chickpeas, potato, banana, and garlic to the saucepan with the chicken and ham broth. Cook over medium-high heat for about 10 minutes, or until soft. 5. With a slotted spoon, remove the chickpeas, potato, and bananas, and set aside. Add the cabbage and cook over medium heat for 5 minutes. Add the fish sauce and pepper. Remove the cabbage. 6. Arrange all vegetables, meat and broth into a large serving bowl. Serve hot with the Eggplant Sauce and steamed rice.